With its subtly textured, lustrous finish, Venetian plaster epitomises timeless elegance. As a lime-based product, it celebrates the organic beauty of polished natural stone, transforming walls and ceilings into handcrafted works of art. This centuries-old veneering technique dates back to Roman times, and was used extensively in Venice during the Renaissance period. In the 15th century, Venetian architects veneered the walls of their canal-side buildings with a wet mixture of crushed marble and slaked (powdered) lime, which was applied in thin layers and ‘burnished’ or polished to a glossy finish with a flat, steel trowel. The finish recreated the opulent look of marble, but without weighing down the buildings’ watery foundations as stone cladding would have done. Venetian plaster also proved to be highly durable and well-suited to the city’s damp conditions. Today, ‘Venetian plaster’ describes many forms of decorative or polished plaster. Specialist plasterers sometimes use other terms, including: Venetian stucco, Marmorino & Polished plaster. Venetian plaster is the ultimate bespoke wall-surfacing product, as it can be customised to suit the style of your home. It can be smooth or highly textured, polished to a gentle gleam or a high-gloss, mirror-like glaze. Choose a bold colour, a pearlescent or metallic finish, or a pared-back neutral. 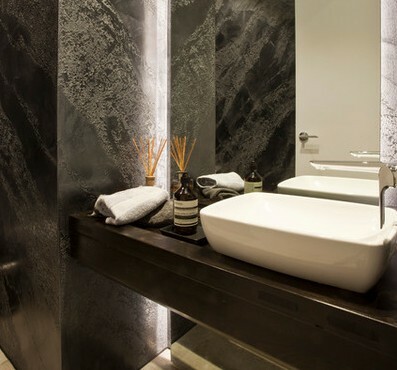 Venetian plaster can also be designed to mimic the look of natural stones, such as marble, travertine or limestone.